With music streaming services in large supply and at low cost, the competition has become too much for Microsoft's Groove Music service. Beginning on January 1, 2018, the Groove Music app will not allow users to buy, stream, or download any music. As a replacement, Spotify will be the new recommended music streaming service. 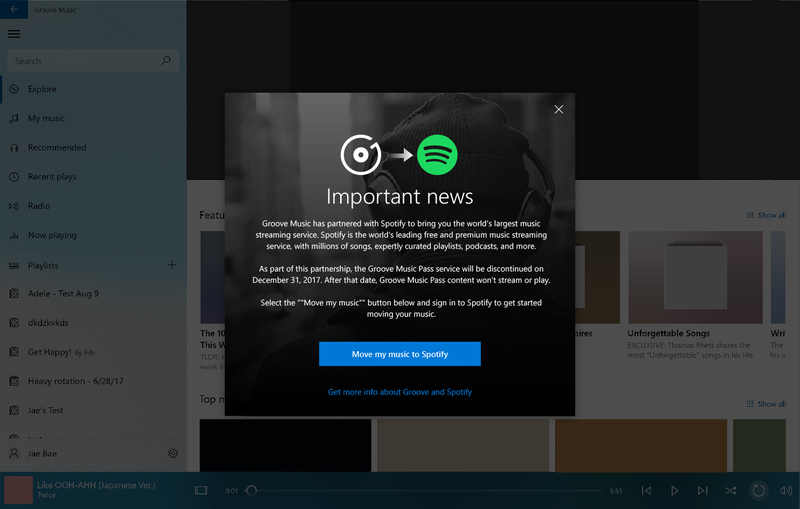 Windows Insiders in the fast ring will be able to transition their Groove Music Pass libraries over to Spotify as early as next week by signing in to their Spotify accounts through the Groove Music app. With over 30 million songs available on Spotify and over 140 million active users, it is about time that Microsoft has conceded that Groove Music was not going to beat the competition. Instead, an official Spotify app has finally made it to the Windows Store (soon to be branded as the Microsoft Store) this year and also to Xbox One. Although Microsoft is removing the streaming and purchasing of music from Groove, the app is not going to be a dead project. Microsoft plans to continue support for the app to use as a media player and to organize music that may be stored locally. As part of the switch, Groove Music Pass subscribers will be eligible to receive 60 days of Spotify Premium for free if they switch before the end of January 2018. Should any users forget to cancel their Groove subscriptions, Microsoft will be refunding users that have subscriptions extending beyond its life cycle and will offer a 120% store credit if the original payment method cannot be refunded.